This painting depicts a still life of fruit on a marble ledge, with a view of a wooded landscape in the background to the right, and a bouquet of flowers in an ornamented urn to the left. The fruit on the table includes black and white grapes, a cut melon, peaches, plums, figs, red currants, a branch of blackberries, a walnut and some hazelnuts. The bouquet includes African marigolds, foxgloves, iris, auricula, a cockscomb, yellow and dark-purple hollyhocks, a peony, pink and white roses, a carnation, double narcissus, and cockscomb. On the table, in front of the melon, sits a beetle. A bee has alighted on one of the African marigold flowers, together with a meadow brown; a fly sits upon a peach, a bumble bee nearby. A female silver-studded blue hovers above the cockscomb. Georgius Jacobus Johannes van Os was the son of Jan van Os (1744-1808), who was a successful still-life painter in the late eighteenth and early nineteenth century, and who was Georgius’ teacher. Georgius’ sister, Maria Margaretha van Os (1779-1862), and his elder brother, Pieter Gerardus van Os (1776-1839), also became artists. Maria also mainly painted still-life subjects, while Pieter mostly gained renown with his landscapes and animal paintings. In 1809, Georgius van Os won an honourable mention in the annual contest of the Amsterdam artists’ society Felix Meritis having submitted a still-life watercolour. This is thought to have encouraged him to focus on still-life painting, but also, like his father did, he painted landscapes. As well as oils, he also excelled in watercolours. In addition, he also became a skilled lithographer. Initially he worked in The Hague, where his father had his studio from 1773 until his death in 1808, but subsequently he moved to Amsterdam. From 1812 onwards, he alternately spent periods of time in the Netherlands and in Paris, where he finally settled in 1826. In Paris he partly worked for the Sèvres porcelain manufacture. He also continued to exhibit his works in the Netherlands; on the occasion of an exhibition in The Hague in 1843, the Dutch queen bought three flower paintings by van Os. In his own time, Georgius van Os was considered to be a better and more successful still-life painter than his father. Particularly his later work was an important source of inspiration for pupils such as Hendrik Reekers (1815-1854). The choice of motifs in this still life also largely is that of Jan van Os, featuring a lavish choice of high-quality fruit and flowers, both exotic, such as the cockscomb, and more common, such as the roses and poppies and the carnation. Grapes, melons and plums were also fairly common, but both father and son van Os show us choice examples of those fruits, all looking freshly picked. The overwhelming quality of this meticulously painted work is enhanced by its excellent state of preservation which allows the viewer to enjoy Georgius Jacobus Johannes van Os’ mastery in its full glory. [i] The watercolour illustrated here, Teylers Museum inv no. Z 008, 480 x 373 mm, signed lower left, fully follows the idiom of Jan van Os. 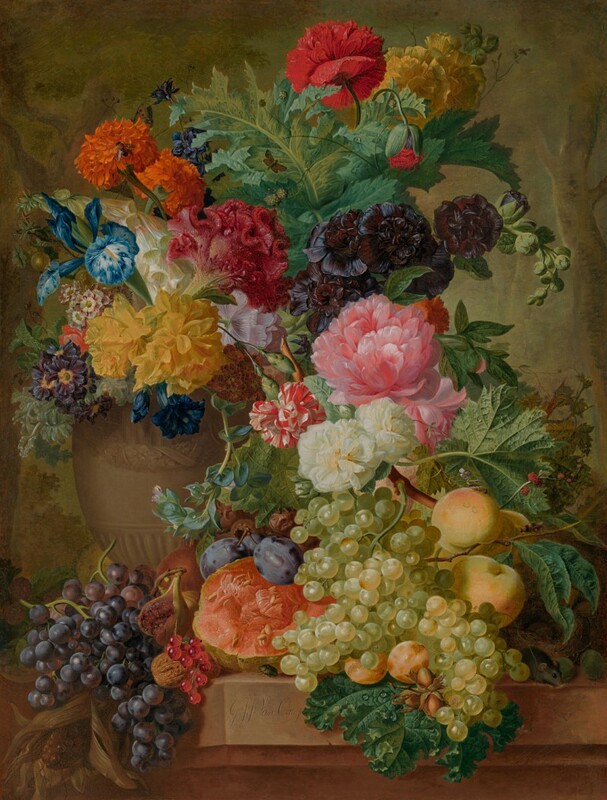 [ii] An auction in Amsterdam in 1809 included a painting of flowers and fruit by him, and for the exhibition of Living Dutch Masters of 1810, he submitted a fruit piece and a flower piece (Lyst der kunstwerken van nog in leven zynde Hollandsche meesters, welke tot de algemeene tentoonstelling van 1810 zyn toegelaten, cat. nos. 61 and 63). [iii] A painting signed and dated ‘G.J.J. Van Os 1809’, sold at Van Ham, Cologne, 15 May 2015, lot 589, colour ill., is so different in style and handling both from Georgius van Os’ paintings and watercolours, that it must be by a different hand. The painting from 1815 (fig. 2), oil on canvas, 146 x 114,5 cm, was auctioned at Christie’s Amsterdam, 26 April 2006, lot 213, colour ill.
[iv] The painting by Jan van Os in fig. 3, oil on panel, 87,6 x 67,3 cm, was auctioned at Bonhams, London, 3 December 2008, lot 72. [v] Compare, for instance, a flower painting, oil on canvas, 52 x 40,7 cm, signed, sale London, Philips, 10 December 1996, lot 178, colour ill, and (fig. 4) oil on canvas, 50 x 38 cm, signed, sale Munich, Helbing, 30 October 1902, erroneously as by Jan van Os, correctly as by G.J.J. van Os on the Zürich art market in the 1950s.